Home » How to convert 1080p HD MKV to iPhone 4 video on Mac? “I’d like to put a movie on iPhone 4, but to no avail. The movie is *.mkv file. What should I do with it? I heard that iPhone 4 plays HD video...” If you are facing the same problem, this article will definitely help. MKV (Matroska Video) is a container format including video, audio, image and subtitle tracks inside a single file, and it likes formats MOV and AVI to support video compression and codec. MKV video, especially MKV in HD, becomes more and more popular. And this guide is talking about converting 1080p HD MKV to iPhone 4 video so as to watch HD MKV videos on iPhone 4 more freely. Using Pavtube iPhone 4 Converter for Mac, you can easily convert 1080p MKV files to 720p iPhone 4 videos, and remain only the chapters you like. Pavtube iPhone 4 Converter is one of the top iPhone 4 tools for you to convert HD recordings, footages and movies at high quality. It allows you to adjust the advanced parameters, create new costumed formats, crop video, trim video, add watermark, replace audio with desired music, join videos together and split video at ease. In the following guide I’d like to share with you converting 1080p MKV files to iPhone 4 supported formats with best video quality. You can download a free version of iPhone 4 Converter for Mac (intel only, Mac OS 10.5 and above) and try it out, only there is a Pavtube logo on the screen. Step 1. 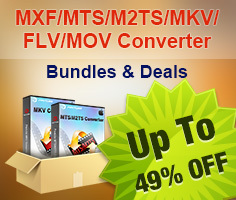 Load 1080p MKV videos to the Mac iPhone 4 Converter. Run the Mac MKV to iPhone 4 Converter Click the Add button to load the HD files that you'd like to convert, or simply drag and drop the 1080p source MKV files to the program. The Mac iPhone 4 HD Converter supports batch conversion, so multiple 1080p HD MKV files can be loaded at once. When the 1080p MKV files are loaded to the program, you can view the videos from the Preview window. Simply select an item and click the “Play” button. When the video is playing, you may take snapshoot when it plays to your favorable frame by clicking the “Snapshoot” button. Click the pull down menu of "Format", and then tap "iPhone" preset. There are multiple formats specialized for iPhone 4 videos, you can select any one of them to meet your needs freely. According to Apple’s official site, the iPhone 4 supports “H.264 video up to 720p, 30 frames per second, Main Profile level 3.1 with AAC-LC audio up to 160 Kbps, 48kHz, stereo audio in .m4v, .mp4, and .mov file formats”. 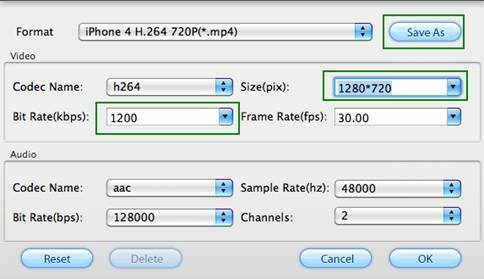 So if you’d like to maintain the best video quality for iPhone 4 playback, “iPhone H.264 720P” will be the right choice. And the 1080p MKV will be converted into iPhone 4 720p HD MP4 videos. In order to save storage, you may choose “iPhone 4 MPEG-4 640*480”. The popup ripping window of this Mac HD to iPhone 4 Converter will show you conversion progress, time elapse, left time, generated file size and estimated file size clearly, so that you can control your time and storage space of your iPhone 4G HD in a proper way. To join multiple 1080p HD video clips together, check the box of “Merge into one file” before conversion starts. Once the ripping task is completed, you can click “Open” button at the bottom of the main interface to get the final output 720p HD MP4 files for iPhone 4 with ease. Sync the files to your iPhone 4G with iTunes for entertainment. Trick 1. Adjust audio and video quality and file size. You are encouraged to use the default settings. However, when you feel like improving HD video quality, or cutting down file size, please click on “Settings” button to further customize output iPhone video. Generally, higher bit rate results in higher video quality and bigger file size. If you’d like to use the same settings for future conversion, simply click “Save As” and save your settings as a new profile. When the MKV to iPhone 4 Converter is lunched next time, you can click on the “Format” bar find the new profile under “Custom” tab. Trick 2. Trim 1080p MKV videos to iPhone 4. Click on “Edit” menu if you’d like to convert partial of the 1080p MKV files. 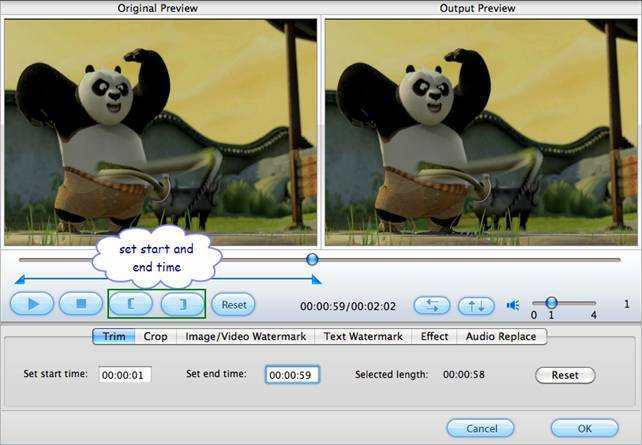 To trim the movie, simply click on 'Trim' tab and type in desired time value in ‘Start’ and ‘End’ box and click ‘Set’ button. Or you may also click left square bracket and right square bracket to set start and end time when playing the 1080p MKV files.